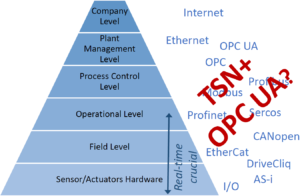 With the foundation of an application-focused interest group covering the whole field of industrial production, we intend to define the future application of real-time ethernet in automation. We evaluate technologies in practical environment and keep proven concepts from the state of technology. Of course, in the sense of technology leadership, this has to be done now (and not only after the last specification has been finished). Our activities are interdisciplinary and cover different vendors and industries – focused on production engineering and industrial automation. The Industry Working Group creates a strong link between network technology providers, component manufacturers, software companies, machine and plant manufacturers, research institutions, etc. May we add you to this list? How will this work? That’s what we would like to decide together with you. Within the scope of the Industry Working Group TSN for Automation, ISW would like to introduce itself as a research institute and system integrator.